W. W. Norton & Company, 9780393285130, 368pp. Amid the biggest economic transformation in a century, the challenge of our time is to make sure that all Americans benefit from the wave of digital revolutions around the world that have permeated and upended modern life. Yet today's economic arguments seem stuck. We need a new vision of a hopeful future and a new action agenda. So many Americans are uncertain about the future. How can there be so many paths to opportunity with so few people traveling them? As a nation, we have to understand what is required to help Americans succeed now, and how to prepare our country for what comes next. We have been here before. A hundred years ago, America experienced the greatest economic transformation and technological revolution in its history. The transformation of the past twenty years--as the world has moved through the information era into the digital age--has turned our life and work upside down once again. It is a time of tremendous change but also of tremendous possibility. Rework America is a group of American leaders who know from experience the challenges we face--and the potential solutions. In America's Moment they suggest a practical agenda for an exciting future. It is illustrated by people who are already showing the way and includes actions Americans can take today in their own communities: preparing people to succeed, using the reach of the Internet and data to innovate jobs and to reach new markets all over the world, using technology to match employers and workers, and transitioning to a "no-collar" working world-- neither blue collar nor white collar. 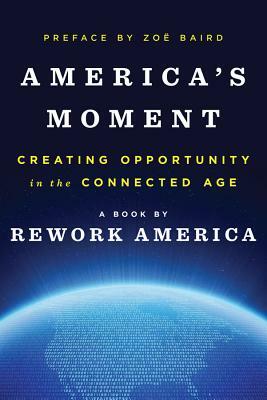 Set against the history of how Americans succeeded once before in remaking their country, America's Moment is about the future. It describes how the same forces of change--technology and a networked world--can become tools that can open opportunity to everyone.